Europeana is Europe's digital platform for cultural heritage. It provides free online access to nearly 60 million digitised items drawn from over 3,500 museums, archives, libraries and galleries across Europe. Our collections feature a huge diversity of content from 43 countries and in 23 different languages, on various themes and media, including artworks, photographs, 3D images, maps, newspapers, and more. Around 20 million of our collections are openly licensed and suitable for education. With our initiative in education, we aim to bring these unique and rich resources to every student, educator and lifelong learner offering curated material (thematic collections or virtual exhibitions), ready-to-use resources (apps or ebooks), but also workshops about educational hot topics, like STEAM or critical thinking. 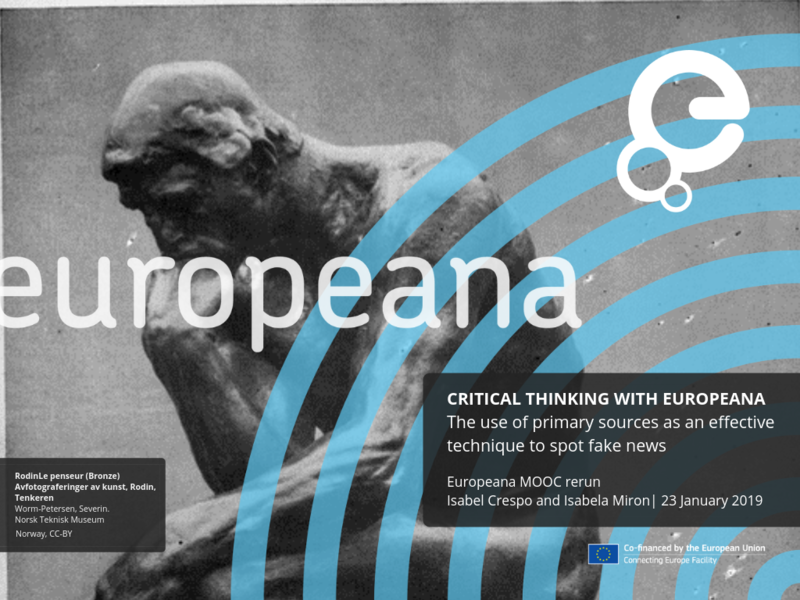 For the OE week 2019, we present the webinar ‘Critical thinking with Europeana, the use of primary sources as an effective technique to spot fake news’. Various forms of propaganda are still present all around the world, for instance in the form of populism and radicalism. Recognizing its tools is essential in these increasingly digital times, where we live more exposed to the consequences of fake news and the post-truth, phenomena that use similar techniques. To this end, Europeana offers a webinar where educators will learn how to equip their students with the necessary media literacy and critical thinking skills to spot fake news. All by using Europeana open resources for education. Particularly, educators will learn more about: the value of digital culture and the use of primary sources to foster critical thinking; Europeana free resources like thematic collections or datasets to use in class; specific usage cases, incl. storytelling examples, learning scenarios and more. To participate in the event, please take first your ticket in Eventbrite.